Give a customer special pricing or a discount on services add-ons or surcharges. To set a custom price or discount for a customer, click the customer link in the side navigation or the icon below. Select the customer whose pricing you want to modify by clicking on their line. Select the "Pricing and Discounts" tab at the top of the page. You can override the default service, add-on and surcharge rates for a customer by setting a fixed rate or percentage discount. 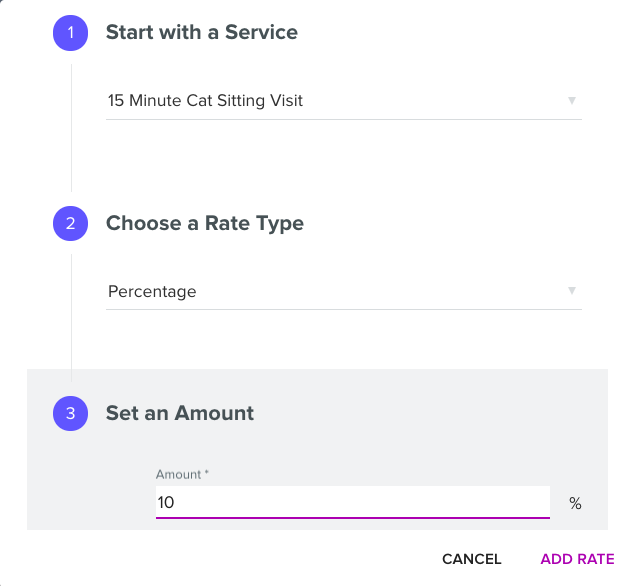 To add a custom service rate, click add custom rate in the top right corner of each section. Charges are calculated by applying a fixed fee or by applying a discounted rate (%) to the global service rate. Your global service rate is $10 and you want to give a one dollar discount, you have two options. Choose the service you wish to override. Choose to apply a fixed service rate or a percentage discount. Click "Add Rate" to save you setting.